There have been several nice observations since I first posted my comments on this website, but I have to set the record straight about one. And add a comment on another. Lowell has either misaligned me with another person (perhaps Chet Huntley) or his memory is faulty. My recollection is I have been in only one motion picture. And to confirm that I am probably right, I get a residual check from only one. As far as I can recall, I was in just one picture, Power. It starred Richard Gere, Julie Christie, Gene Hackman, Denzel Washington, E.G. Marshall, Fritz Weaver, Kate Capshaw. Sidney Lumet directed it. If I am wrong about my movie credits, please send further information to the Screen Actors Guild and the American Federation of Television and Radio Artists (SAG & AFTRA) and maybe I will get more retirement. There is a question that I have often pondered  where is the big earthen mound at Memorial Park that the Easter Pageant was staged on in those years? Here again is Jim's Internet Movie Database (IMDb) list of credits. Location: In Tulsa right now actually.. Okay, I've got a question I've been pondering for a few weeks, so let's see if any legends (or otherwise) can answer: How the heck do you get a radio program director's attention? Oh, I know how NOT to, sure. Been out of broadcasting school for a few weeks now, but every PD I've spoken with, it's hurry up and wait, or nothing, if they're in that mood that day. I've got the talent, and a love of radio, but patience? Just not one of my virtues. By the way, for those who know Bill Southern (from KOTV way back), I suggested he surf by. Suffice it to say this won't be happening any time soon!! Oh yea, anyone but me noticed Paul Serrell on CBN News? Elizabeth MacLeod's list of the 100 most significant moments in radio broadcasting is quite interesting, even though some of them occurred much before all of us were born (if anyone cares, I don't remember much before the 1938 "shocker," "War of the Worlds" but I have read about most of the rest). I think it would have been helpful to have the incidents listed chronologically, though. I'm reminded of a recent (1996) book I've noticed, called, "Blast from the Past: A Pictorial History of Radio's First 75 Years." It's probably unfair to call it a "coffee table book," but it is jammed with photos of most of the people who contributed to the growth of the industry--all the way from a rare 1878 Matthew Brady photo of a 32-year old Thomas Edison with one of his early phonographs to one of actor Kelsey Grammer as "Dr. Frasier Crane" conducting Crane's mythical talk show on NBC's (and KTUL's) "Frasier." About the only people I couldn't find in the book's excellent index were overnight talk show host Art Bell, who managed to exceed Larry King's Mutual station lineup a couple of years ago (King brought Bell on CNN to talk about it) and Herb Morrison--though there's a picture of the dirigible Hindenburg burning and two of the airship's skeleton. The book's chapters treat each decade from pre-l920 to the 1990s. And the forewords (2) are written by Rush Limbaugh and Tulsa's own Paul Harvey. I am further reminded that with TU basketball out of the way, KRMG has resumed its old-time radio broadcasts on Saturday nights from 8:10 to 10 p.m. Last Saturday Joe Riddle played the Amos and Andy 25th anniversary show (with cameos from Jack Benny and Bing Crosby) and interviewed a fellow who has pretty much mastered all the voices and is busy "recording" scripts from the very early A & A shows which weren't recorded. His demo, which was played, was fascinating! Riddle has also played a great deal of Lum 'n' Abner, Jack Armstrong, the Allllll American Boy, and Fibber McGee and Molly. I highly recommend the show! Art Bell's radio show is good entertainment for a night owl like me. Art is receptive to any crackpot idea his guests care to float out, and he has a few of his own ("The Quickening"). But his matter-of-fact presentation of these weirdo topics sometimes creates an "X-Files"-like mood. Beware the Chupacabra! The show can be heard in Tulsa on AM 1430 (the old KTUL/KELi frequency) after midnight. If you are talking about the concert at the race track...NOT THE CONCERT AT THE BALL PARK...I remember seeing a person that resembles the description you gave hanging around backstage...carrying a "Lucille Look Alike" hollow body guitar...and acting like he should be there...To the best of my knowledge this was NOT...I repeat NOT Charles Marsh...(I went to college with Charlie at OSU, and saw him many times after that in many different situations, not the least of which was on the David Letterman Show)...I do not know who the person in question was...but he looked to me at the time, and as I remember the occasion, as someone who was trying very hard to look like he belonged there in order to get backstage and be close to the folks that really belonged there. I hope this can help your questioning mind to rest...but I do not have a clue as to who this mystery person was...except to say that I saw him at several concerts in the early seventies, and never was able to find anybody that really knew who he was...(another of those X-File moments in our lives, I guess). A quick p. s.: Charlie Marsh was, as I recall...right-handed...although it might be hard to tell when he was standing on his head and playing the guitar. He is playing left-handed in the screen capture of him from "UHF". I wonder if he was asked to switch for some reason. "UHF" is coming out on DVD 6/4/02. Charles Marsh appears in Amazon's cast list for the movie. Thanks, Lee. It was John Bateman. I may not be searching correctly when I look at the Johnny Martin posts so I hope I'm not duplicating anything someone else mentioned about him. When I worked with Johnny, I was struck at the 'intimacy' he had with his audience and wondered how he developed that. He told me that his pre-radio days were as a musician and then a band leader. Some of his musician experiences were in a small ensemble setting like a piano bar. I think he said he was a drummer. And he told of conversations with the audience, and I'm guessing that's how he carried over his remarkable ability to have 'conversations' with his unseen radio audience. Most of the Johnny Martin comments on this site (including your own) have been collected on the Johnny Martin page, where you can also hear him. The cameraman Dennis Eckert alluded to must have been John Bateman. (One of my fav people) But then again I may be wrong. He was also right about Johnny Martin's sense of pace, mood and timing. No shows like that anymore, at least not in this area. What memories reading the Guestbook! (I stumbled across this web site when I got word one of my favorite DJ's -- Art Roberts of WLS, Chicago -- died a few weeks ago) I was the night 'newsman' on the Johnny Martin show for about six months in 1970 before I joined The AP. The six months before that did KRMG traffic reports and morning 'in-the-field' news, running into Larry Thomlinson a lot when he was at KOTV). I was pretty lousy at news announcing but David Stanford helped me a lot to improve my voice. And the late Dale Speer, intrepid City Hall reporter for the Tulsa World, helped significantly on helping learn the news business in Tulsa. It would be great to share memories. The AP experience was wonderful in one sense that I was fortunate to be hired as the first AP reporter in Oklahoma from a radio or TV station (at least that what's the AP bureau chief told me). While at KRMG, we were all pretty competitive against the other radio and TV stations, but moving into the AP it meant that a lot of great news 'sharing' was now possible, and thus I had this great opportunity to get to know TV-radio reporters much better. A 'major breakthrough' occurred when Mike Miller found the FBI radio frequencies on a small radio. With my amateur radio background, we were able to program them into the new technology of scanners and break lots of large crime news involving federal agencies. There was a KOTV photographer (first name of John but sorry, last name faded away with a few brain cells about four years ago) who helped get other scanner frequencies for the Fed agencies (DEA, ATF, Secret Service, et al). When one of the Helmerich's was kidnapped for something like a $600,000 ransom, John picked me up and we spent the night a few blocks from where the kidnapper lived, listening to the FBI radio comms. I'll never forget what happened at first light. John and I were sitting in his van (the top bristled with radio antennas) when a car pulled alongside. Someone got out and tapped on the driver's window. John rolled the window down, and Tulsa Police Chief Jack Purdie said: "Hello John...Hello Dennis...just what in the HELL do you think you're doing?!" Ken Ragsdale was a good friend, and I was Best Man at his wedding. I met Kenny when he was police reporter at the Tulsa World and forgot how he got into TV. But, he sure enjoyed it. But I've lost touch with all those folks, and would enjoy sharing stories on the Guestbook. Ps -- Johnny Martin taught me something about successful music radio. "You gotta know Pace, Tempo and Mood", he said, segueing from Peggy to Frank. What an amazing person! I remember one night in 1970 that a high school senior called (think she said she went to Nathan Hale) and said the senior class had just voted Johnny "The Best Make-Out Disc Jockey In the World." Welcome, Dennis! 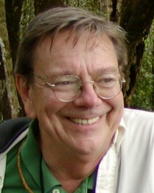 Added your comment to the Johnny Martin page. To Mike Bruchas: Richard Dowdell spent a little time on the dark side himself. I worked with him at OETA channel 11. He was a reporter there for a couple of years. He is a great guy. Easter is a weird holiday in Broadcasting. My company gives us Good Friday off and if we work - triple time but nada for Sunday. In TV Easter is never recognized as a family holiday - the best I ever had was places bringing in some semblance of a ham dinner for those working but that was only in 2 shops in my now almost 30 year career. It's also a hard day to get fast food if you are working - most places close. At 8 the joke on newbies was to have them fill in their timesheets for holiday pay for Easter and wait for them to get yelled at by middle management - the worst I heard was, "Dummy, Easter isn't a g.d. holiday like Christmas" - some kind of mixed message in that. In Brazil - the Brazilian Formula 1 Grand Prix ain't observing the holiday this weekend - they are racin' - but I think Monday all is post-hang-over day and folks are off...I am working on US Grand Prix coverage. Anyone know if the "Oil in Oklahoma" series with Bob Gregory is available on VHS or DVD? I remember watching those specials growing up and really enjoyed them. It'd be GREAT if they were available for purchase. I checked the library and the book is available, but not the videos. Does anyone know if they can still be bought? Mike Bruchas sure got it right about many, if not most, of the attendees at the Easter Pageant. This was the only time of the year that, with parents' approval, a guy got to take his girl out and spend the night with her in his car. I always noticed that most of the cars had windows that were entirely fogged up. I'm sure there were a lot of "joyful noises unto the Lord" on that special night. My conception of the pageant is now somewhat maculate. Did anyone catch 20/20 Friday night? Native Tulsan Bob Brown did a story on the history of the song and play "Oklahoma!" It was actually a very entertaining story. I think it would be very difficult to find a state that is more proud of its state song. We can fairly claim to have the best state song in the union. While looking at the UHF section I ran into Charlie Marsh's picture. I must tell this story. For 30 yrs this has been a puzzle to me and now answered, I think. In summer of 1972 around the 4th of July, I was 19 years old and at the fairgrounds there was to be an outdoor concert held featuring Leon Russell, I think Jesse Ed Davis and Jesse's dad was there, the old fart sporting a 19ish girl at his side with about 25 pounds of turquoise around his neck, The Spencer Davis Group and a host of others. During the day while we waited for it to start as they were setting up equipment, out of nowhere this guy in a turquoise loud suit and bright red guitar began to stand in front of the stage. He stands there for what seemed an eternity. He looked like the Big Bopper. I thought he musta been someone that was gonna guest the show and was checking out the audience. Just as fast as he appeared he disappeared. For the entire duration of the concert I looked for this guy to perform somewhere as a back-up or something. I really thought he was someone famous, but for the life of me I didn't have a clue. Nowhere did I see this guy. So for all these years I thought this guy was some retard, star wannabe and they politely threw him out. I now think it had to be Charlie Marsh. I recognized that he had been around the area in the late 60's-early 70's and his face and yes, the left-hand guitar. Really for 30 years I wondered who the hell it was and I do believe it was him. If anyone knows how to get a message to him, pose the question and it will clear up. Ricardo, can you shed any more light on this subject? I have enjoyed reading this web site over the past several weeks. I am a native Tulsan (went to Holmes, Wright, Edison) and lived there until I was about 26 years old. My father owned the auction on 71st street between Peoria and Lewis (across from the old Riverside Drive In). Back in the late 60's and early 70's, I was a DJ at KTOW, KRAV-FM, and KRMG. I also did news for a period of time at KAKC. The main people I remember working with are Arthur Johnson (who was Art Johnson at KTOW; prior to that, he was Jay Arthur on KAKC News); Roger Borden, PD at KRMG while I was there. (After about 6 months at the station, it changed format from rock to religious programming; I left and from there went to KRMG.) People I remember from the KAKC days were Scooter B. Segraves (whom I met up with again in New Orleans during the late 70's), Jim Peters, Tom Gordon, Steve Suttle, Randy Castle (real name Casselman, I believe), Lee Bayley, Dan Stone, and Doug Moore. While working at those stations, I also was attending TU. After graduating from TU, I taught at McLain High School for four years, then moved to Austin to get my Ph.D. From there, I moved to New Orleans, where I was on the faculty of the University of New Orleans for 9 years, and then to Tyler, Texas, where I currently live. Again, really enjoy reading the web site and seeing all of the references to the Tulsa where I grew up. Keep up the good work. Here's further entertainment while browsing this site: KRMG is streaming a Police & Fire Scanner realtime on the internet. I don't remember John Henry toplining a music show on Saturdays; he had a lot of sports broadcasts on weekend. However, his regular fifteen-minute show at 10:30 p.m. Monday through Friday was at one point expanded to thirty minutes (to ll p.m.) and renamed "Sports Call Music Hall." A popular tune of the day was "Buttons and Bows" (My bones denounce the buckboard bounce...). And the term "disc jockey" was still in the future--when DJs started, as I remember, they were known as "Combo operators," meaning they could run the board, playing their records, and also take readings from equipment panels after the FCC took pity on shoestring operstors and let them hire non-engineers who could pick up a license that basically certified they could read English (I still have mine somewhere and I didn't go to Dallas to get it, either). I can testify that John Henry did indeed have a beautiful wife (and their tiny twin daughters were even more charming). I think her name was "Lee"--but I never had an extensive conversation with her; she rarely came to KVOO. I lost track of the family after John took a job at KOA in Denver (that used to be one of NBC's key affiliates, but the call letters have long since been changed due to changing hands. I heard John died, apparently of a heart attack, shortly after moving to Denver. Great site, love to hear from anybody who graduated Central in 1956 or thereabouts. Thanks, Chris. A reminder: you can use the TTM Search Engine to find all pages on this site that mention "Plaza Theater" (also try alternate spelling "Plaza Theatre"; it is mentioned both ways). The Search Engine is on the main page and the What's New page, among others. The TTM Search Help page provides details for advanced searchers. The Prologue page has a good overview of the site. Tulsa TV people is a list of names to jog your memory. Let us not forget Jim Hartz's brother Herb was Tulsa's top cop for many years. The Easter Pageant drew crowds of up to 50,000 each year at Memorial Park. (I still find that number almost unbelievable, but that is what the newspaper said.) I participated in the pageant four years, two on stage, and two (or was it three?) as co-narrator. Unlike the cross-linked co-conspirators Ruddle and Confer, I played the roles of bad guys, and could wear tons of warm clothing under my costume. I didnt know that Bob West played the role of Jesus. Bob was narrator the two years (1950 and 1951) I had a role on stage. West, who had a beautiful, expressive voice, did a beautiful job. When I participated, the Christ figure was played by the very tall, slender Roy Ball. In these performances the felons on either side of him were permitted to wear warm clothing, but Roy toughed it out. There he was, hanging--blue--on the cross, with only a lonely loincloth for protection. It always was strange that the weather leading up to the Easter Pageant was usually quite pleasant, but on the night of the performance it always was brutally cold and windy. Actually, it could be worse. Both times I narrated it--in 1953 and 1954--the pageant was canceled. The first year, in addition to the cold, a thunderstorm came up, and Jesus almost got hit by lightning while on the cross. Ball scampered down in a hurry, not waiting for a miracle to save him, and avoiding an early ascension. The next year there were very heavy rains for the day before and on the day of the performance, making Memorial Park a quagmire. The cemetery people requested that the pageant be canceled. On both occasions we proceeded with our broadcast of the event. I still have the tapes of the KRMG production and a copy of Miss Ronans script. It was Roy Ball. I was surprised at his words. He always took his role in the pageant very seriously, and was never out of character. Although he was very nice, he never mixed with the rest of the cast. Of course he was older than we college and high school students were who made up the rest of the cast. With Isabelle Ronan's retirement the curtain came down on a rich, productive, and beautiful era in Tulsa that had started when she began teaching at Central back in the mid-1920s. Yes, Isabelle Ronan started and continued the Easter pageant for many years. The idea that it was cancelled because of weather brings a smile, because one year it was 28-degrees with a freezing rain and we went through with the program. Noel Confer and I were the two thieves who hung on either side of Bob West, who, as usual, got the big job. We had to get up on the crosses, hold onto metal tabs that went between our fingers, and wait there for about a half hour before West, the Roman soldiers, and the rest of the pack arrived. Let me note that we were dressed in the briefest of loincloths and that by the time the garments had been gambled over and the procession had moved away we were close to hypothermic collapse. My feet had no feeling for about an hour and Confer was in no better shape. It was agony and we were truly able later to say that we had suffered on the cross. As I recall, somebody had a bottle in a nearby car and we thawed after a while. Don Norton and I have been exchanging a few e-mails about the old days. His last message triggered some memories. I suppose cyberspace has replaced the pot-bellied stove and the "spit n' whittle club." I remember John Henry's broadcast of the 1948 state basketball championship between Central and Okla. City Classen. Classen had a 6' 7" center, very unusual at that time. His name was Pete Darcy, who later starred at Okla. A&M. Central lost at the buzzer when Darcy scored on a tip-in. By the way, Central's best player was Marcus Arrington, who was later at the center of TU's basketball resurrection under Clarence Iba. Another Henry broadcast I heard was a state high school playoff game between Central and McAlester in 1946. Central won the state championship that year. For some reason the football playoffs were suspended the next year, although the basketball championships continued. Henry did the TU football games, also. He could make a good game sound very dull. One friend of my dad's would turn on a TU football game on Saturday afternoon. He said that he always had a good nap while listening to John Henry. Henry had a favorite description of a hard tackle---the use of the word "plow." For instance, "LeForce makes it to the 35 yard line where he is plowed by the defender." Using this word in that situation irritated some people. John did a rather unusual thing during KVOO Day, when Miss Ronan's Central speech students took over all the production of the station for the entire day including announcing, writing, newscasts, drama shows, and music programs. When it came time for Henry's two sportscasts, two Central students were assigned---Wally Renegar and Dolph Bridgewater. They each had a script. Wally asked John Henry how he would know when he was supposed to stop reading and Dolph would begin. Henry said, "You'll know." When the program started, it soon became apparent what Henry had in mind. When Wally read a story or two, John, standing behind the two seated students, suddenly put his hand over Wally's script and nudge Dolph. After Dolph read for a while, the hand swooped down again on Dolph's script, and Wally would resume. This continued for the entire fifteen minutes. John Henry apparently had a tragic home life. He told a friend of mine that his wife, a beautiful woman, was perminently in a state mental institution. However, he couldn't divorce her because a person couldn't legally divorce a spouse who was incarcerated while living in such an institution. Although he was well-liked, John Henry didn't seem to be a very happy man. Of interest to Frank and others: the Tulsa Easter Pageant was cancelled this year. To blame were rainy weather, which hampered rehearsals and created outdoor wiring problems, finances, and a shortage of performers. Attendance and interest has waned in the last three years, but it should be back next year. Wasn't it started by Miss Ronan? According to the World, the Jaycees built "the mound" at Chandler Park in 1959 as a permanent staging ground for the play after crowds grew too large (70,000+) for Memorial Park. Skelly Stadium was tried in 1958, but had noise problems. 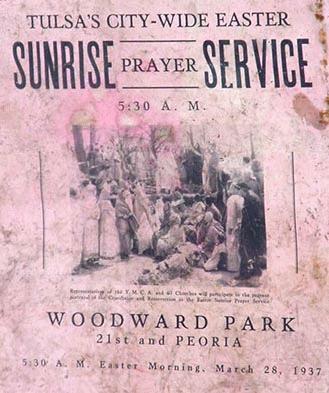 It began in Woodward Park, moving to Memorial in 1946. Location: Frolicking through the woods on the first day of Spring! Jim Hartz (IMDb) has always been my favorite national anchor but we forgot to mention his movie credits! His movies weren't bad and I think he would have been recoginzed as a first-rate actor if he stayed at it long enough to get some roles that really fit his persona. Speaking of movies, William Whitney (IMDb) from Lawton died. Beginning at the age of 21, he spent his life making some of the best movie serials and TV series in the history of the mediums. Just finished reading "FM - The Rise And Fall of Rock Radio" by Richard Neer. It's a good chronology of what was perhaps the last U.S. major market free-form commercial Rock radio station, WNEW-FM in New York. WNEW-FM went from Rock to Talk in late 1999. Unlike "Radio Waves" by Jim Ladd, Neer names stations and the players and holds little back. Those of you who have either worked in or remember free-form radio from the 60s and 70s will find this an interesting read. If you worked in the business many of the players will be familiar to you. My oldest friend, Milt Haynes, died in New York City on February 15. Many will remember Milt as a newsman and host of Music Til Midnight on KRMG in the late 1950s and early 60s. He left Tulsa to accept a CBS News Fellowship at Columbia University, then reported for the network from Africa. He returned to New York, left CBS News, and joined WNET, the flagship station of PBS where he anchored a New York City newscast. In the mid-70s he shifted his attention from news to psychology. He earned a graduate degree from Fordham University in New York, and was a practicing psychotherapist in NYC for the rest of his life. Tulsa media followers will remember Milt for his deep baritone voice, his prose-poetry writing style, even in newscasts, and his eclectic music interests. Frank Morrow had inquired about Milt awhile back...wish the news were better. Welcome to Jim Hartz! As many of you know, Jim was on KOTV's "Sun Up" in the early 60s, and became news anchor/news director at Channel 6. He co-anchored NBC news in NYC for ten years, then was tapped to host the Today Show for almost three years in the mid-70s. He is also noted for hosting "Over Easy" on PBS with Mary Martin (who played Peter Pan on TV in the mid-50s, and was Larry Hagman's mom). What all have you been up to since then, Jim? I mentioned to my mom that we had heard from Jim Hartz. She recalled living in a duplex at 710 N. Quaker as a kid/teen. Directly across the street was a church pastored by Jim's dad, who was friends with John McCormick of McCormick Cleaners, where my grandmother worked for years. Mom remembered Jim as being the youngest in his family, and as a very likable guy. Thanks for signing in, Jimmy! Purported Jamaican tele-psychic Miss Cleo ("I keep it real and that is the key, keepin' it real. No reason not to.") is actually Youree Dell Harris, born in L.A. of American parents. Now on the site of the old Jade East Restaurant (see Tulsa Tiki) is the Tokyo Garden, complete with bamboo curtains and walking bridge over a koi pond (and a 3-star rating). Also for latter day Tiki lovers, "Aloha Taste Of Hawaii" at 71st & Yale serves up authentic poi and hula dancing with your Luau for Two. By the way, I just discovered that James Michener's Hawaii (all 1000+ pages) is a great read. For OKC fans, broadcaster Pam Olson has been named to the Oklahoma Journalism Hall of Fame. She now freelances for the Tulsa World. John Hillis and Lee Woodward were just discussing transmitter sites, cued by David Halpern's photo of KVOO's. We saw a personalized aluminum good luck token, which in times past you could buy from a token machine. Radio coverage of TU basketball was discussed. Jack Morris has a big fan in Joplin, MO. Bob Hower paid a visit to this site for the first time. We saw Bob's book about the 1921 race riot, and read a behind-the-scenes story involving him. Bob did the very first newscast on KOTV (Tulsa's first TV station). Joy Cooper told a personal story about Tulsa musician Dwight Twilley. We learned a lot about how and why Channel 8 blocked liquor and feminine hygiene commercials. We talked about Channel 2's current program, "World's Worst Movies". We were sad to hear of the passing of former Tulsan Mary Stuart Houchins (longtime actress in "Search for Tomorrow"), and of Howard K. Smith and Chuck Jones.